The Treadmill of Stigma, Language and Mental Illnesses : NPR Public Editor When Nina Totenberg asked if someone was a "nutcase," listeners objected. Mental health experts say that so much of the language used by the media, and by all of us, stigmatizes people with temporary or chronic mental illnesses, affecting their ability to get jobs and housing. But can political correctness go too far? 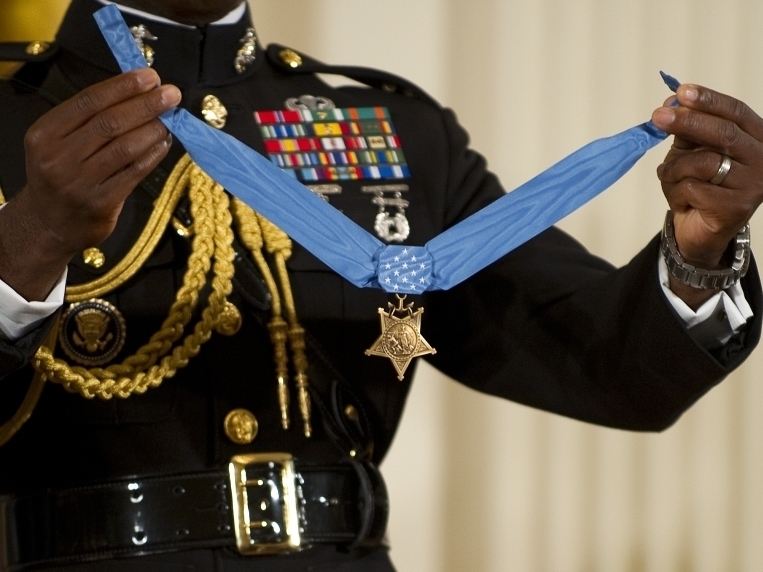 A military aide holds up the Congressional Medal of Honor. The 2005 Stolen Valor Act makes false claims about receiving military medals punishable by up to one year in prison. Veteran reporter Nina Totenberg hit a nerve for some Morning Edition listeners last week when she asked a lawyer whether or not his client, Xavier Alvarez, was a "nutcase." Alvarez is a habitual liar. One of his lies—a false claim that he was awarded a 1987 Congressional Medal of Honor—is the subject of a current dispute before the U.S. Supreme Court and in many editorials. The debate revolves around whether such a lie is free speech or a crime punishable by jail time, as Congress stipulated in 2005, when it comes to lying about military medals. In a story about the case, Totenburg was rightly curious whether Alvarez has a mental illness that caused his behavior, but she didn't state it that way on the air. Rather, she said to us, the audience: "Inevitably I had to ask his lawyer this question: 'So is your client a nutcase?' "
She later explained to me: "I thought the question begged to be asked, and since Alvarez is in jail (for insurance fraud), he was unavailable. Therefore I asked his lawyer. I regret if I inadvertently seemed to say something inappropriate about mental illness. That was not my intention." Some listeners were indeed offended. "I was quite surprised and concerned to hear a normally respectful and professional journalist on NPR like Ms. Totenberg use such a derisive label in an equally derisive tone of voice," wrote Douglas Aupperle, a psychologist and listener from Des Moines, IA. Kristin Davis, from Madison, WI, wrote, "Mr. Alvarez may indeed suffer from some form of mental or emotional illness, but calling him a 'nutcase' demeans what is a very serious issue for many Americans." Not all listeners agreed. As one commented online, "I'm sick to death of the political correctness rules ... we use words like 'nutcase,' there's no reason to avoid them." Political correctness can surely get out of hand, but stop and think for a minute: It is highly likely that you or a family member or friend has at some point had some kind of mental illness. And yet we often stigmatize it in ways that we no longer do with physical ailments, or race, or any of a number of human conditions. Calling someone a "nutcase" for something they can't help and others may share is out of bounds, a rare overstep by the normally careful Totenberg. Any reporter could have been tempted into the same mistake. The word is concise, catchy and connects with the audience in everyday language. It's normally an editor's job to save a reporter from such temptations, but that didn't happen here. Terms like "nutcase" and other words used to denote people who behave oddly—such as "headcase" or "psycho"—are objectionable because the intent of the speaker is to disparage the person being described. Consider, for example, the difference in connotation between saying, "My husband has bipolar disorder" and "My husband is a nutcase." Indeed, that is precisely the function that was served by using the term in this report. Having established from the first sentence of the report that Mr. Alvarez is a habitual liar, asking his lawyer whether he is a "nutcase" added nothing to the listener's understanding of his behavior. It served only as a put down, which is the case whenever it's used. Perhaps worse, such words contribute to a stigma about mental illness that, according to a 1999 Surgeon General's report, discourages people from getting the treatment they need. The report said that the stigma also makes it difficult for people with a mental illness to get jobs, find housing and participate fully in society. So what should journalists and the rest of us say? Bob Carolla, a spokesperson for The National Alliance on Mental Illness (NAMI), a mental health advocacy organization, said that Totenberg could have simply said, "'I have to ask the lawyer: Does he have mental illness?" A spokesperson for the American Psychiatric Association suggests the terms "mental disorder" and "psychiatric illness," too. The ill person can be the hero, and has been in many films and many TV productions. And in life. The premier of Norway, Prime Minister Kjell Magne Bondevik, resigned to address his depression, came back and was re-elected. Around us change is happening, in language it seems stalled. People invent new words for emotionally charged referents, but soon the euphemism becomes tainted by association, and a new word must be found, which soon acquires its own connotations, and so on. Water closet becomes toilet (originally a term for any kind of body care, as in a toilet kit and toilet water), which becomes bathroom, which becomes restroom, which becomes lavatory. According to Pinker, it's not the words, but the concepts that are most important to society. The euphemism treadmill will continue as long as people have negative attitudes toward the concept at hand. Of course, "nutcase" should never have been acceptable in a journalistic report. But if Pinker's theory holds, even words like "mental illness" and "mental disorder" might eventually become unacceptable, too. Like Pinker's treadmill, language itself is an endless conversation. Please jump on. You surely have additional insight to offer.